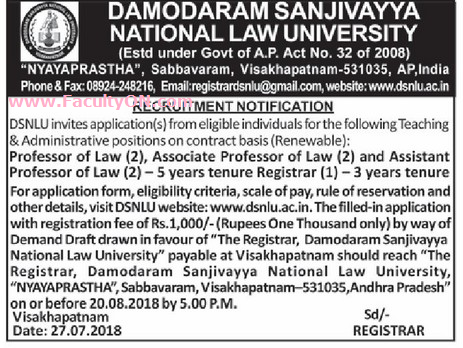 Damodaram Sanjivayya National Law University, Visakhapatnam has advertised in the EENADU newspaper for the recruitment of Teaching Faculty- Professor / Associate Professor / Assistant Professor / Registrar jobs vacancies. Interested and eligible job aspirants are requested to apply on or before 20th August 2018. Check out further more details below. About University: With growing importance for quality legal education, various national law schools acquired lot of importance. To meet the requirements of students of this State, the Government of Andhra Pradesh decided to establish a new Law University and as per the decision of the Council of Ministers meeting held on 30-06-2008 the Governor of Andhra Pradesh promulgated the Andhra Pradesh University of Law Ordinance, 2008 on 8th July 2008. Subsequently the cabinet on 04-08-2008 approved Andhra Pradesh University of Law Bill, 2008, replacing the Ordinance and this Bill was passed by the State Legislature on 28th August 2008 and became an Act after the same was assented to by the Governor on 23rd September 2008. How to Apply: Interested and eligible candidates are requested to download application form and send filled-in form along with, application fee DD, copies of certificates and recent passport size photo to the postal address given below.